A brilliant book about a princess who swaps places with a dragon when she finds she doesn’t live up to the expectations placed upon her. 2. Magnetic Play Fairies (Imagine That) A beautiful, reusable activity book where the child can practise fine motor skills and hand eye coordination whilst creating magical scenes with the fairy magnet pieces. 3. Storytime: The Littlest Dragon (Quarto) This book is wonderful! The story is of a little dragon who can’t even breathe fire, but then (thanks to an unlikely friend and a well timed sneeze) saves the day! 4. Search and Find Fairies (Imagine That) A gorgeous, fairy themed activity book that will keep little ones actively entertained for hours! 5. Again! (Two Hoots) A (relatable!) tale of a dragon refusing to go to sleep until his favourite book is read over and over again. The ending of this book is awesome and had my children in fits of giggles! 6. Zog and the Flying Doctors (Alison Green Books) We LOVE this book with its detailed illustrations, rhymes and brilliant story. It’s moral is fantastic, teaching children that they can be whatever they want to be! 7. Dragons: Father and Son (Quarto) Is a stunningly book about a young dragon who wants to earn the respect of his dad. In trying to do so, he learns valuable lessons about the consequences his actions would have on others. 8. Dilbert Dragon And The Magic Garden We adored how this beautifully illustrated story teaches children to love themselves for who they are. 9. Doughnuts for a Dragon (Egmont Books Ltd) A hilarious children’s book about a boy who searches for a dragon and uses baked goods to help distract the various other mythical creatures he comes across on his adventures! Sure to get some giggles…and maybe a few requests for doughnuts! 10. Sir Lilypad (Simon & Schuster Children’s UK) Very funny children’s story about a frog with great ambitions! so I will be sure to go and have a look at a few of these . Oh brilliant, pleased you liked our recommendations. 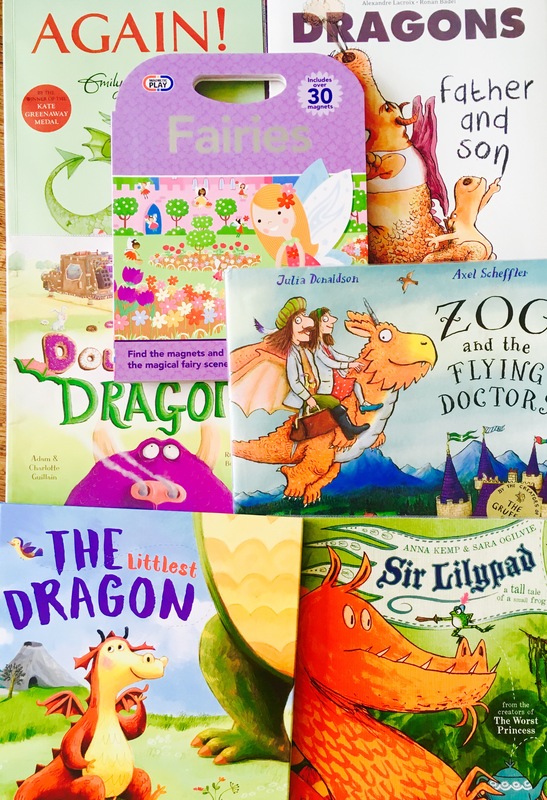 It’s amazing how many brilliant books there are out there about dragons for children! I love your book and toy reviews. You make buying for my nieces and nephews so much easier.